Elements is a fantastic new app for iOS devices that doesn’t really do anything new, except for how well it does it: it is a lovely and versatile text editor for iOS that deftly integrates with Dropbox and TextExpander to allow you to create and edit documents across multiple devices, from your iPhone to your Mac. As a fiction tinkerer, I love it: Elements will slurp in any document in your Dropbox folder and allow you to easily edit it, versioning any changes every thirty seconds. 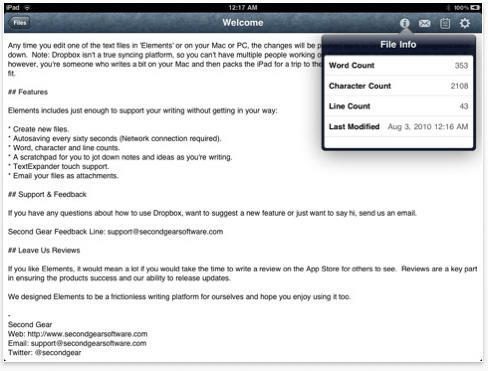 It even gives you statistics on what you’re writing, like word and line count. The interface is just the way I like my text editors, devoid of any fancy rich text formatting. I’ve been using it in conjunction with my favorite OS X text editor, WriteRoom, and it’s like the two applications were umbilically entwined from birth. Elements is a fantastic program for any iOS writer. It can be purchased from the App Store now for just $4.99.